At 35, she's the youngest chief prosecutor in a major American city, and just four months into her elected post. She had the task of making two announcements: That the recent death in police custody of a 25-year-old black man named Freddie Gray was considered a homicide, and that she would be bringing charges against the police officers involved. The legal requirements: A recap of the events leading to Gray's death, based on her office's investigation, and the homicide charges being brought against the police officers. If she did nothing else, she needed to press those charges publicly and state them precisely, so this portion of her remarks sticks to the script. Setting boundaries and acknowledging frustrations for police and citizens: The second portion of this speech turned to setting boundaries. Mosby, who noted "I come from five generations of law enforcement officers," made a public point of telling police not to leak information from the investigation, and assuring them that charges against a few are not an indictment of all police. 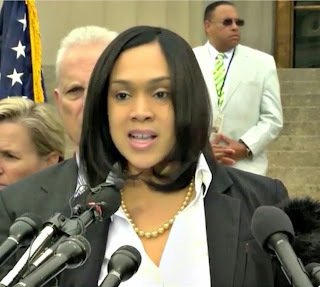 She also spoke directly to the citizens, particularly the young people of Baltimore, to urge them to continue to play a part in the justice process. She said,"I have heard your calls for 'no justice, no peace.' However, your peace is sincerely needed as I work to deliver justice on behalf of Freddie Gray." Listen to the emphasis in these particular lines--the delivery makes them clear. Answering questions: Finally, Mosby answered questions from the press, another requirement when public and elected officials face the media and the citizenry. Here, too, she set boundaries for herself based on due process, noting when she could not answer questions because it would involve sharing an opinion or would interfere with the legal process. This last section let us see her speak extemporaneously as well. Reporter: What do you think needs to be done so that what happened to Freddie Gray doesn't happen again? Reporter: How do you think we're going to get that? Mosby: You're getting it today. She was bold, straightforward, and in control of these remarks and exchanges. People took to the streets of Baltimore again after she spoke, but to celebrate this time, and she's being credited with diffusing tensions with this speech. While her remarks had an important job to do and legal boundaries to respect, they also inspired and shared the bigger picture, echoing this Gary Haugen TED talk on justice as the answer to poverty. The Washington Post said the emotional tenor of her remarks were spot-on: "Mosby struck a beautiful balance between the righteous anger of the community and the necessary respect for law enforcement." What can you learn from it, eloquent women? Slow down your lists: The initial, scripted, formal part of Mosby's statement involved many lists: Lists of individual charges, lists of involved officers and their titles, lists of events that occurred. Any time you are reciting a list in a speech, slow it down with a distinct pause between each item. It's not too much to include two short beats of silence in between items in a list, a pause that will be imperceptible to your audience and allow them to hear what you are specifying. After all, if it's important enough to put in a list, shouldn't you slow down so we can hear it? Mosby's delivery here was well-paced and clear as a bell, on a day when that specificity mattered greatly and legally. Connect with your wider audience: As a public official, and an elected one to boot, Mosby's remarks needed to go beyond the formal charges to the justice system, and speak to the protestors. Uniquely able to do so because of her age, she made a point of ending her statement to them in fellow feeling: "Last but certainly not least: to the youth of this city, I will seek justice on your behalf. This is a moment, this is your moment. Let's ensure that we have peaceful and productive rallies that will develop structural and systemic changes for generations to come. You're at the forefront of this cause, and as young people, our time is now." Own it: Mosby's entire delivery could be summed up in four words: "The buck stops here." She's confident in her facts, carefully laid out and confirmed by independent investigators. She's anticipated the challenges she may receive, and can answer them. She takes responsibility. She takes the time to address those who may disagree, and those who might take her remarks to a violent place, moving beyond her to-do list to her must-do list. Her delivery isn't cocky, but certainly confident and forceful. Would that we all felt this level of conviction when speaking! Watch the video here or below, and stand by for more from this forceful and eloquent woman. These remarks are well worth a watch and listen to see the most difficult kind of public speaking, covered live by media around the world and in the wake of violence. Got a panel coming up? Whether you're a conference organizer, speaker, or moderator, you'll have a better panel--and a sparkling discussion--if you plan with The Eloquent Woman's Guide to Moderating Panels. At just $3.99 in all ebook formats, it's like having a coach with whom you can prepare and bring on stage with you.